Why are oxygen levels in brains of MS patients unusually low? A photograph of blood vessels in the brain of an animal model of MS. 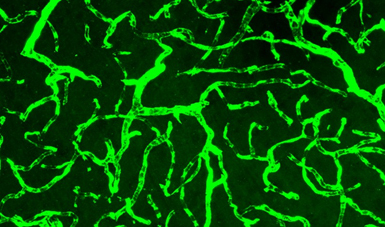 They are green in this image because a green fluorescent dye was added, making capillaries visible under a microscope. Yang, R. and J. F. Dunn (2015) Reduced cortical microvascular oxygenation in multiple sclerosis: a blinded, case-controlled study using a novel quantitative near-infrared spectroscopy method. Sci Rep 5: 16477. Runze and I just published this paper. It has two major new findings. One is that, in about ½ of patents with MS, the brain shows signs of hypoxia (unusually low oxygen levels). This is based on quantifying the amount of oxygen bound to hemoglobin in the microvessels. The other news is that we could obtain a measure of brain oxygen using a method that is easily translatable to a clinic, doesn’t hurt and only takes a minute. It is less inconvenient than having your blood pressure measured in your arm. As we move forward, we have to find out why this hypoxia exists—could it be a totally new measure of the amount of inflammation in brain? I’m sure it will tell us something new and may become a new method for detecting treatment response. In my opinion, this paper opens up a totally new way of looking at MS—much like MRI did when they first showed that plaques existed. We are taking steps towards understanding what is changing in the brain of patients with MS.
Hypoxia is a term for low oxygen. If you climb a mountain, there is less oxygen and your body is hypoxic relative to a person living at sea-level. Different methods are used to measure oxygen in brain because a direct measurement is pretty difficult—unless you implant a probe to quantify oxygen. 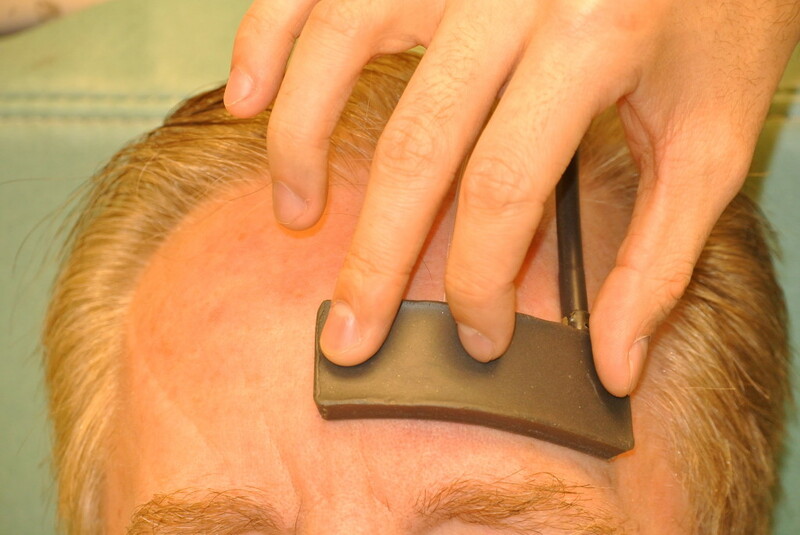 In our study, we used a method called near-infrared spectroscopy or NIRS. Hemoglobin is a protein in the blood that carries oxygen. If all hemoglobin has oxygen bound, then the oxygen saturation is 100%. Light is absorbed differently if the hemoglobin is bound to oxygen or not. That is why blood in arteries is red and blood in veins is more purple or bluish in color. With NIRS, we shine light into the head and quantify the amount of oxygen bound to hemoglobin, by looking at the different color of light coming to our detector. The method focuses on the small vessels, like the ones in the image above, where oxygen is being transferred into the brain (the capillaries and microvessels). Most NIRS can’t quantify between subjects. Our method uses frequency domain NIRS to obtain absolute values. Big words, but the main point is that we can get an absolute measurement of the oxygen saturation of hemoglobin. We found that about ½ of patients with MS were hypoxic—using the definition that the amount of oxygen bound to hemoglobin was lower than in control subjects. This wasn’t caused by low inspired oxygen, or an inability of the lungs to work. The low oxygen related to a low delivery of oxygen to the brain relative to how much is being used. A kind of supply problem. It is too early to say if this hypoxia is damaging to the brain. The brain is pretty tolerant of low oxygen. It is very likely that the hypoxia will change how the immune response functions in the brain. Hypoxia could make the immune response worse. A second large benefit to our paper is we show that our NIRS method is capable of detecting the hypoxia. The method is easy to use and only takes a few minutes of your time. It involves holding a small pad against the forehead for a minute. Now that we have shown that hypoxia exists, and that we can measure it, the next chapter begins. Why is it there? Is it a marker of unregulated inflammation? Could we use it to tell if anti-inflammatory drugs are working? Inflammation can damage the blood vessels in a way that changes how flow is regulated. Cells responsible for Inflammation can also use a lot of oxygen. Should we re-investigate oxygen therapies? Could it be that major oxygen therapy trials didn’t show significant results because they only worked in the patients that were already hypoxic? At the time of the trials, we had no way to tell, before treatment, if the brain was hypoxic or not so all patients were treated equally. We have a new method and are now showing that it is sensitive to changes in the brain of patients with MS.
Another cool part of this study is that the funding to do it came from undergraduate student salary grants. This was not a big, well funded study. We cobbled together money for Runze (we wrote this while he was an undergraduate student). Most of his funding was from Alberta Innovates Health Solutions. The equipment funding came from AIHS and Canada Foundation for Innovation. Author Jeff Dunn ImaginerPosted on November 15, 2015 November 15, 2015 Categories looking at brain with light (NIRS), Multiple Sclerosis4 Comments on Why are oxygen levels in brains of MS patients unusually low?